Lightly season chicken drumstick and prawns with a pinch of salt and dash of pepper. Steam over rapid boiling water for 4-5 minutes. Once prawns are cooked through, remove but leave the chicken drumstick in the steamer until meat is cooked through. Remove chicken and shred the meat. Retain the stock for use later. Scald beehoon. Drain and leave aside. 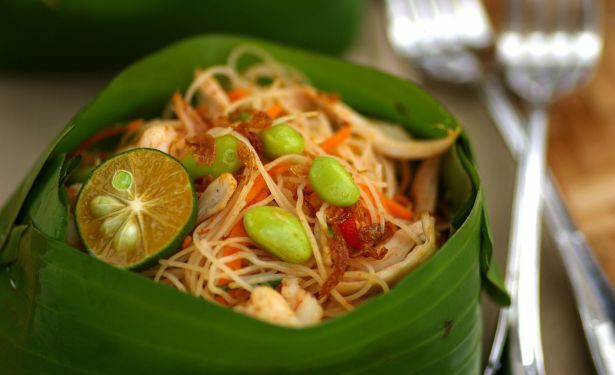 Combine beehoon, prepared chicken meat, prawns, lemon grass, shallots, torch ginger bud, 2 tablespoons prepared basic sambal (recipe below) and seasoning (A). Toss well to mix. Add 3 tablespoons chicken and prawn stock. Toss until well combined. Add edamame beans to mix. Dish out into banana leaf cups or place in individual plates and serve. Process chillies and belacan in an electric blender or food processor. Add a little calamansi juice to allow the machine to run smoothly. Season with salt and sugar to taste. Remove edamame beans from the freezer and allow to thaw for 5-6 minutes. Bring a pot of water to a rapid boil. Drop in the edamame beans. Stir for 1-2 minutes. Drain well immediately. Leave to cool slightly then remove beans from their pods. Use the beans for the above given recipes as required.